Nestled between the Outeniqua Mountains and the Indian Ocean on the east coast of South Africa, lies the seaside town of Knysna. A gem of the scenic Garden Route, Knysna is home to some of the most stunning scenery and indigenous forests in South Africa. Must-see attractions include Buffalo Bay, Knysna Forest and the Knysna Elephant Park. Cheap flights to Knysna are now available for a limited period of time, so pack your beach hat and hiking boots, and head down to this coastal paradise! The hub airport is George Airport (GRJ), which is a 1-hour drive from the centre of Knysna. Knysna is the ultimate retreat for a spot of relaxation. Surrounded by a sprawling coastline and sweeping forests, Knysna is the perfect setting for any kind of holiday. Explore the nearby wine routes and get lost in the jungle canopies. 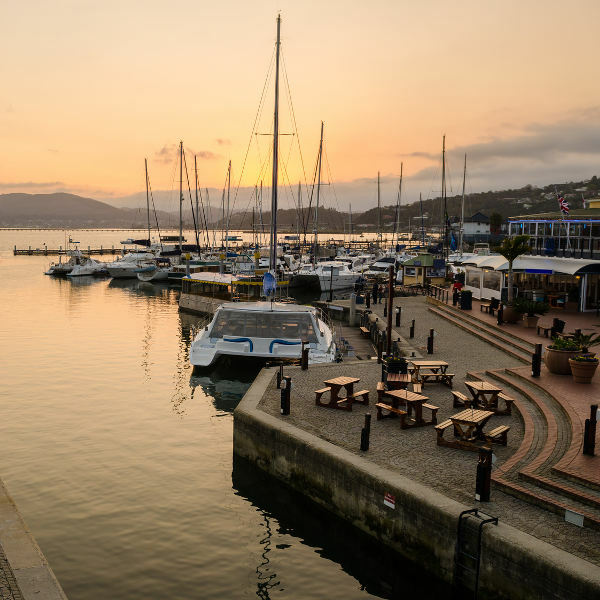 From hiking, canoeing and ziplining through the natural landscapes, to exploring the bustling shops and cafés along the harbour front, there is always something to do in Knysna. The Oyster Festival and Pink Loerie Mardi Gras create a yearly buzz! Backdropped by forested hilltops, the quaint town is nestled amid the most beautiful setting. Dramatic cliffs tumble down to the white-lipped shoreline, where sailboats bob along the turquoise ocean. 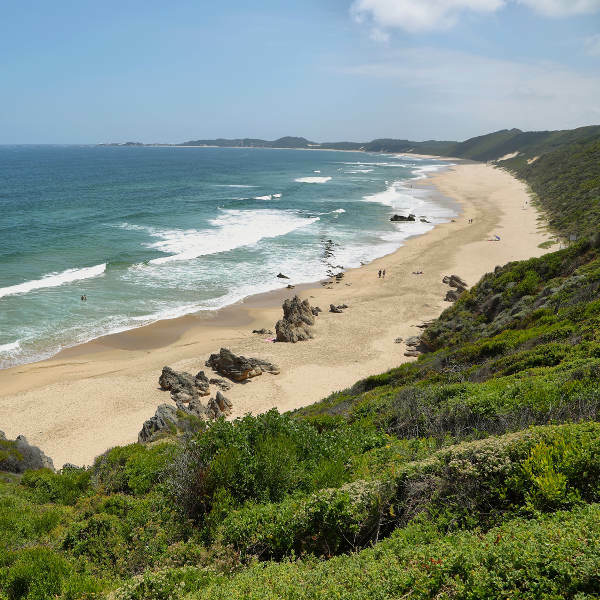 The Garden Route’s all-year-round climate makes it the perfect getaway spot for any time of the year. Summertime (November- April) is gorgeous, with long stretches of sandy beach and the sparkling blue ocean. Bear in mind that Christmas school holidays see crowds and hotel rates surge between December to early-January. Ideally, visit just after the rush (before the Easter weekend). Wintertime (May-October) sees fairly moderate temperatures across the region, and it never gets really cold. Winters are generally quiet (with the exception of school holidays in June/ July) and are the ideal time to explore the gems in and around Knysna. Spend your days hiking through nature reserves, going wine tasting and horseback riding, among numerous other activities. Whale-watching is at its prime in September, while the 10-day Knysna Oyster Festival in July is a wonderful synergy of live music, great food and sporting events. The flamboyant Pink Loerie Festival showcases its annual Mardi Gras in April. Knysna is a painting of turquoise ocean lapping against golden beaches, backdropped by emerald canopies of lush forest and jagged cliffs. An ideal retreat for honeymooners, backpackers or those in search of a wildlife safari, Knysna is the perfect gateway to exploring the famous Garden Route. The coastline is a mosaic of coastal paths, rugged cliffs, hidden caves and caramel beaches. Its two Blue Flag beaches – Buffalo Bay and Brenton-on-Sea – are pristine hotspots for long walks and surfing. See houseboats dotted along the Knysna Lagoon, fringed by the famous Heads. Hop on a ferry to the privately-owned Featherbed Nature Reserve, where you might spot a rare blue duiker amid the lush vegetation. Hike through Knysna Forest, brimming with ancient and exotic trees, including yellowwood, milkwood, wild fig and Cape beech. This sweeping forest is home to the endemic Knysna Loerie. 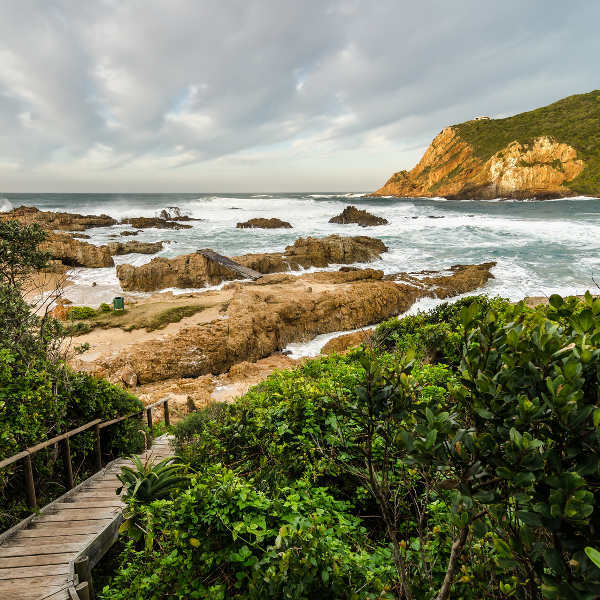 Adventurers can tackle the Garden Route Trail, a 5-day hike through diverse terrain of forests, beaches, cliffs and rivers, from Wilderness to Knysna. For spectacular views over the coastal peninsula, pack a picnic and head up to the Spitzkop Viewpoint, the highest point above Knysna on the Prince Alfred Pass. For a family outing, the Knysna Elephant Park is home to orphaned elephants, where you can touch and feed these gentle giants. Golfing enthusiasts can tee off along the sculpted fairways of the Simola Golf Course and Knysna Golf Club. Discover the town’s charm, bustling with art galleries, cafés and souvenir shops. Read up about Knysna’s founder and involvement in the Anglo-Boer War at the Old Gaol Museum. The Waterfront is a hub of activity and dining, lined with boutique stores and seafood restaurants. Sip on a cold beer as you watch the yachts depart for sunset cruises. The Wild Oats Farmer’s Market is open every Saturday morning – a must for fresh, organic treats! Compare several airlines, and book your cheap flights to Knysna online at Travelstart! Knysna is an exceptionally peaceful town. Because it is tourism-oriented, crime levels are extremely low, with no major crimes occurring towards visitors. Nonetheless, do exercise the usual precautions of keeping belongings secure and not wandering around alone at night. Be aware of strong sea currents when swimming on the beaches, and always heed the warning flags by the lifeguards. Aside from being up-to-date on routine vaccinations, there are no medical requirements for entry into South Africa; unless travelling from a yellow fever endemic country, in which case a vaccination certificate is required. A comprehensive travel insurance policy to cover theft and medical expenses is always recommended for travellers outside of South Africa.